Maclean's Magazine asks us: "Veils: Who are We to Judge?" This cover of Macleans Magazine provocatively presents the diversity of attitudes towards women’s dress in Canada. The caption “Who are we to judge,” is interestingly both accepting and alienating. It seems as though the reader is including secular Canadians in the “we” pronoun, implicitly “other-ing” the woman choosing to wear a veil. Wearing religious symbols has become an especially thorny issue in Quebec. Once a bastion of Roman Catholicism, the Quiet Revolution ushered in a new, deeply secular society in Québec. In 2013, Québec's legislature introduced Québec’s Charter of Values. The Charter, also known as Bill 60, would have banned public employees from wearing “ostentatious religious symbols” to work, or having their faces covered. Although the bill was never passed, it left a sour note in the province, as it exposed xenophobic pockets of sentiment. In 2015, an Internet meme developed that illustrated this xenophobia. It featured the face of a woman wearing a niqab, along with the message (in French): "It is a question of security. 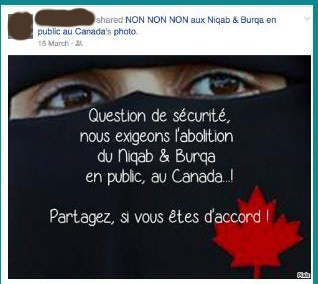 We insist on the abolition of the Burkah and the Niqab in Canada!" Canadian courts have addressed the right to wear hijabs and niqabs in various contexts. In R v. 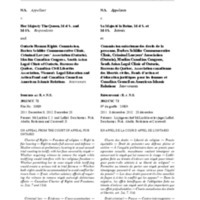 N.S., 2012 SCC 72, the Supreme Court of Canada affirmed that the right to freedom of religion under s. 2(b) of the Canadian Charter of Rights and Freedoms includes the right to wear a niqab. However, this right in not unlimited. In this case, NS was the complainant in a sexual assault. During the preliminary inquiry, NS sought to testify wearing a niqab. Defence counsel challenged her request on the argument that the right to a fair trial includes the right to see the complainant's/witness's face while that person testifies. NS asserted her freedom of religion. The case thus involved Charter rights that appeared to be in conflict (freedom of religion versus the right to a fair trial). The Supreme Court of Canada set out how such conflicts must be addressed, in particular in a case where the witness/complainant asserted the right to wear the niqab. In this particular case, a majority of the Court held that NS must remove her niqab, as the balancing of rights in this case favoured the right to a fair trial and the right to see a complainant's face. The Federal Court of Canada has upheld the right of a woman to wear the niqab during an official government citizenship ceremony. In Ishaq v. Canada, 2015 FC 156, the Appellant, Ishaq had satisfied all elements for becoming a Canadian citizen other than taking the official oath of citizenship. Crucially, her identity had already been confirmed when she took her citizenship test. She was concerned that she would be forced to unveil in public, however, at the citizenship ceremony. Her religious beliefs compelled her to wear a niqab to cover her face while in public. The Ministry of Citizenship and Immigration's policy manual stipulated that those participating in citizenship ceremonies are required to show their faces during the ceremony. Ms. Ishaq sought a declaration that this policy violated the Charter pursuant to sections 2(a), Freedom of Expression and s. 15(1), Equality and that therefore the policy should therefore not be enforced (to summarize the arguments simply). 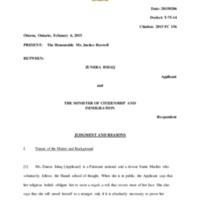 After working through a complex interpretation of various laws, regulations, and policies, Mr. Justice Boswell found in favour of Ms. Ishaq: she was permitted to take the oath of citizenship wearing her niqab. ← What Does a Canadian Look Like?